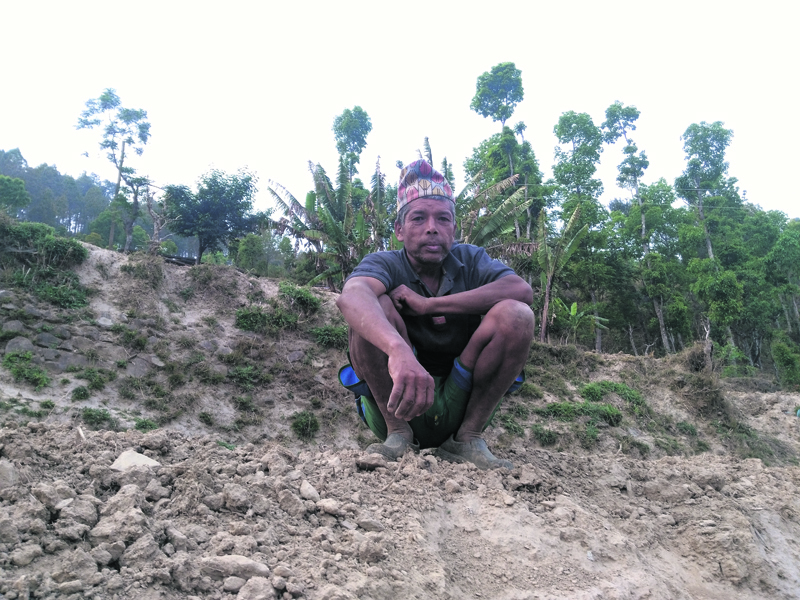 Fifty-year-old Yam Bahadur Giri, a local of Gothapani Village of Chautara in Sindhupalchowk district, used to help in rebuilding houses in his village which was severely affected by the 2015 earthquake. But trained masons like Giri have become jobless due to water scarcity in the village and they have no choice than to wait for the upcoming monsoon. “We have been constructing few houses that were damaged during the earthquakes but the work has been halted due to water scarcity in the village,” he informed. Giri, who also lost his house during the earthquake, has not started rebuilding his own house almost two years after the massive earthquake although most of the villagers in same area have started rebuilding their homes after receiving the first installment of Rs 50,000 of the reconstruction grant from the government. The village has around 22 households, out of which majority are in rebuilding phase. As water sources have dried, post-disaster recovery works in the small village will be further delayed. According to the villagers, six houses in the village have already been rebuilt. The village relies on rainfall for cultivation. Sher Bahadur Thakuri, treasure of the village-based Women Awareness Agriculture Group, informed that around seven water sources have dried up after the April 2015 earthquake. However, they are requesting the district-based government bodies to make some arrangement for water in the village. According to him, the project to bring water in the village is estimated to cost up to Rs 20 million. “If our new proposal to lift water to our village comes into implementation, it will also be used for cultivation as well as for drinking,” he said. He said that the village has received several support from international donors but they have refused to implement the project. “We received the supports from different international donors in hosing, training and many more. But they didn't accept our request for water supply. So we have to depend on government now.”The district-based office of the Water and Sanitation Division has informed that the earthquake has damaged almost 691 drinking water projects in the district and 150 water sources have dried up after the earthquake.